If you want to take a break from the seriousness of life in the old West of Red Dead Redemption 2, then Rockstar have got you covered. As with most of their games going back to the original Grand Theft Auto, they've included a whole host of Red Dead Redemption 2 cheats to let you have fun and mess around with your gameplay experience. 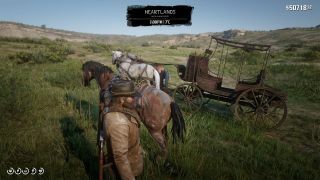 There are all sorts of things you can do with them, from spawning in vehicles and horses, to altering your Wanted and Honor levels, or just giving yourself a huge stack of cash. Whatever effect you want to apply to your game, our Red Dead Redemption 2 cheat codes list covers every need you could possibly have. Where can you find Cheat Codes in Red Dead Redemption 2? Most people will have probably come across a cheat code in Red Dead Redemption 2 without actually knowing it. Many are found at random, scrawled into ice or etched into a cabinet in a lonesome shack. However, there is actually one guaranteed way of finding cheat codes: buying newspapers. Head to Valentine, Saint Denis and Blackwater and pick up the New Hanover Gazette, Saint Denis Times and Blackwater Ledger respectively from the newspaper seller in town. Certain newspapers will only be available after clearing particular flashpoints in the story, and a number of cheats are actually locked off depending on your progress, so to get the best experience, you probably want to finish the campaign first. The newspapers don’t cost very much, and if you’ve already beaten the game then you should be loaded with cash, so quickly pick up every copy available. Once you’ve done that, simply open up your satchel, pick a newspaper, flip it over and zoom in to the bottom of the paper. If the paper has a cheat code, there will be a little tagline underneath one of the articles which contains a phrase. This phrase is what you have to type in to unlock the corresponding cheat code. How do you enter Cheat Codes in Red Dead Redemption 2? Activating cheat codes in Red Dead Redemption 2 is a fairly simple process. Hit pause to access the main menu, then navigate to the Settings tab, and if you look in the bottom right corner you’ll see ‘Cheats’. Tap Triangle/Y to navigate to that screen. You’ll most likely be faced with a blank list if you’re yet to enter any cheats, but fear not! Tapping Triangle/Y once more will open up a text box for you to type in the phrases you’ve discovered during your travels. Once you’ve done that, you can either toggle or tap the cheat codes to activate them in your game. Be warned, activating cheats will disable both saving and Trophies or Achievements, so tread with caution! We recommend entering all the codes you want, then manually saving your game to lock them in before experimenting with them.